Porter Dean Sears (1906-1935), my 2nd great uncle, married Elnora Florence Cannon on July 9th, 1928. Sixteen months later, on November 2, 1929, they were divorced. Dean was the "Libellant" (i.e., the plaintiff) and "Repeated and Extreme Cruelty" was the cause for which the divorce was granted. Alimony was granted in the amount of one dollar. Porter was the younger half-brother of my great grandfather, Arthur Bryan Sears (1900-1964). They shared a mother, Clara Rachel Miles/Myers Sears (1875-1934), though Porter's father was John Alfred Sears (1860-1951). What little I know about Porter's wife comes from their marriage license. Porter was born on December 29th, 1906 in or near Dugger, Indiana. In the 1910 U.S. Census his family was still living in Indiana (note that he is incorrectly listed as a "Miers" in this index). I have not been able to locate Porter's whereabouts in the 1920 census. By at least 1926 Porter made his way to Flint, Michigan where his half brother (my great grandfather Arthur) moved. 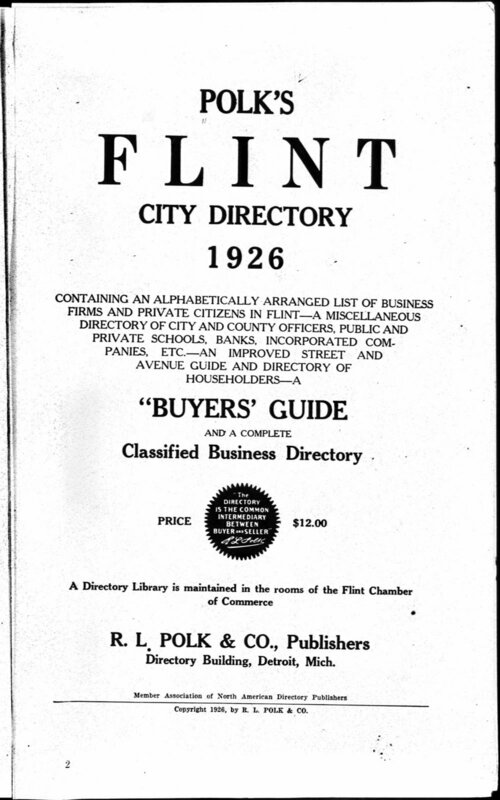 In fact, in the 1926, 1928, and 1929 Flint City Directories he is listed as living at 4606 Carlton with my great grandparents Arthur and Ida Rhoads Sears (1900-2002). I don't have any record of Porter and Elnora actually living together. Perhaps Elnora lived with my great grandparents as well? I don't have a 1930 Census listing for Porter, but he was not listed as living with my great-grandparents at that time. Porter's life between 1930 and 1935 remains a bit of a mystery. He died on May 3, 1935. His cause of death was "strangulation during an epileptiform seizure". It appears as if he may have had a brain tumor as well ("Brain Tumor (?)" listed as other contributory cause of importance). He was 28 years old. As the "Informant" listed on Porter's death certificate, my great grandfather Arthur appears to have remained close with his brother. Porter was laid to rest in Dugger Cemetery in Dugger, Indiana, the same cemetery as his parents and several other family members. Unfortunately I have not been able to find a photograph of Porter Dean. It is possible that I have one of him - I have hundreds of unlabeled family photos around this time - I just haven't been able to identify one of Porter yet. Someday! What ever happened to Elnora Florence Cannon? What was the "Extreme and Repeated Cruelty" mentioned in the divorce record? Did Porter have health issues during the marriage? What was my great grandfather's relationship like with his brother? Where was Porter between 1930 and 1935? What was his life life? I have no record of Porter marrying again or having children. Was he lonely? Are there any surviving photos of Porter? What happens to the darker sides of our family trees? How we learn about, understand, and share the less savory stories of our pasts? This is the 22nd of 52 weekly posts planned for 2018. It was inspired by the #52Ancestors writing challenge issued by professional genealogist, Amy Crow Johnson. The challenge: once a week, for all 52 weeks of the year, write about a relative in your family tree. Older PostThe Psychogenealogist Pic of the Week (#74) - "Secure the Shadow Before the Substance Fades"